You must make reservations at least 5 minutes in advance of the time at Alamo Square Seafood Grill. We have free parking in a lot one block from the restaurant. It is located on Fulton Street at Fillmore, next to the church....come into the restaurant and we'll let you know where to park. we cater for pick up or full catering. 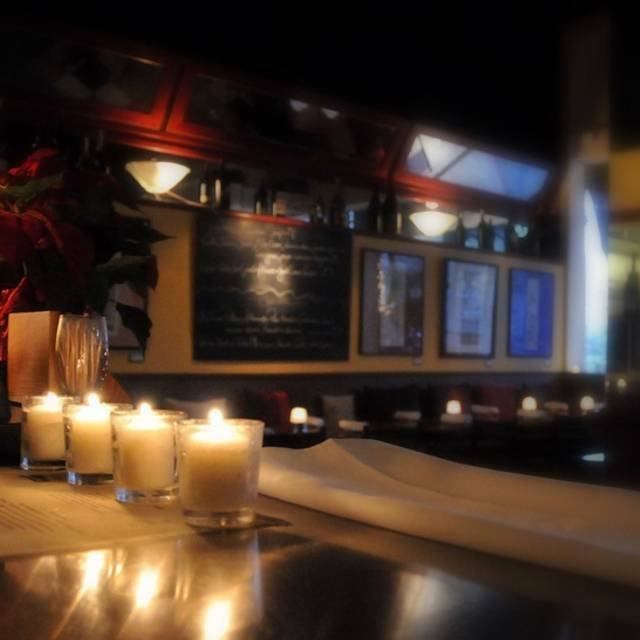 Specializing in serving wonderfully prepared, generous portions of fresh seafood to our San Francisco neighbors and friends for the last 10 years. We cater with a personalized approach by customizing menus to reflect our customer's own taste. We specialize in fresh seafood in generous portions. Come and visit us on Wednesday evening when you can "Bring Your Own Wine" and corkage fees are waived. In the last nineteen years, we have become a neighborhood favorite for a delicious meal at a great price. When Michael Bauer reviewed us he said, "Good seafood value at Alamo Square." and "The owners of Alamo are veterans at offering good food at great value." as well as "Snapper, salmon, tuna, swordfish, and petrale sole are all priced at $15.50 for a generous half-pound portion. Even with nothing else on the plate, it would be a good deal, but when you add the myriad side dishes, it's astounding." Daily from 5:30pm-7:00pm. not valid with Wednesday Free Corkage. There is variability in quality and service over multiple visits, but the place was spot on excellent on my latest visit. Very sweet little spot with excellent service and unpretentious food. Make sure you save room for dessert. The seafood was cooked perfectly and the portions were very generous. We also tried the special octopus salad which was outstanding. We did find the wine prices (mostly $45+) to be a bit high in comparison to the entree prices (mostly $18-$25). We will definitely return! This place is excellent - a great neighborhood spot with a simpler menu, but very delicious. Definitely recommend. We had a reservation for Saturday evening (necessary), the food was amazing and we were delighted to be there. Best value for a fish dinner we have found in SF. Lots of choices for fish and accompanying sauces. A great neighborhood restaurant. We eat here every time we stay near Civic Center/ Hayes Valley as it's only a 15 minute walk. We're looking forward to dining at Alamo Square again. Our experience was good, but not great. We were seated immediately, the restaurant has a lovely, relaxed feeling that we really enjoyed, and everyone was friendly and welcoming. Our waitress was also friendly, but unfortunately it seems she could use some training. She didn't know the menu and she didn't seem to know that part of her job involved making sure she had all necessary info for our orders. For example, shortly after we all arrived she asked if we were ready to order. We needed more time and she left, but apparently forgot to come back. We had to flag her down. When one of our party asked for a second glass of wine she just left, rather than asking if anyone else would also like another glass. For my main course I ordered the steamed mussels with frites (the mussels were advertised as coming with frites for $3 more). Apparently she did not hear "with frites" and the mussels arrived solo. When I asked if my fries were coming she replied "you have to tell me you want them." I understand she didn't hear me, but I did not know she didn't hear me and in any event she also didn't ask whether I wanted the accompanying frites. To be fair, we all felt she was trying, she just didn't seem to know what to do and we wondered whether she was new and needed more training. Regarding the food, my mussels were perfect. The fries (which did eventually show up) were very under-seasoned (I did ask for salt but she never brought any). One of my friends ordered the trout provencale, she said the fish was nicely cooked but the provencale sauce was disappointing and consisted only of chopped tomatoes. My other friend ordered the rib eye steak which he felt was cooked well but was tough. So, overall there were some high points and some not-so-high points. Perhaps they were just having an off night. The waiter was very nice and attentive, the fish was cooked exactly right however the salad and vegetables were either old or overcooked. I wish you had just fish with sides you could order fresh. Very fresh salmon with beurre blanc was perfect! Service was a bit slow, but the setting is so nice we didn’t mind. And the food is always spot on - fresh seafood, simple but elegant preparation. No corkage on Wednesday is just icing on the cake! This place is a true neighborhood gem. Welcoming and delicious. I ordered the fish soup that was supposed to have crab, shrimp and fennel frogs. It had none of these and the fish it did have was dry and the broth was flavorless. The service was poor as well. My friend and I won't be back. This was our third time eating here, and it did not disappoint. 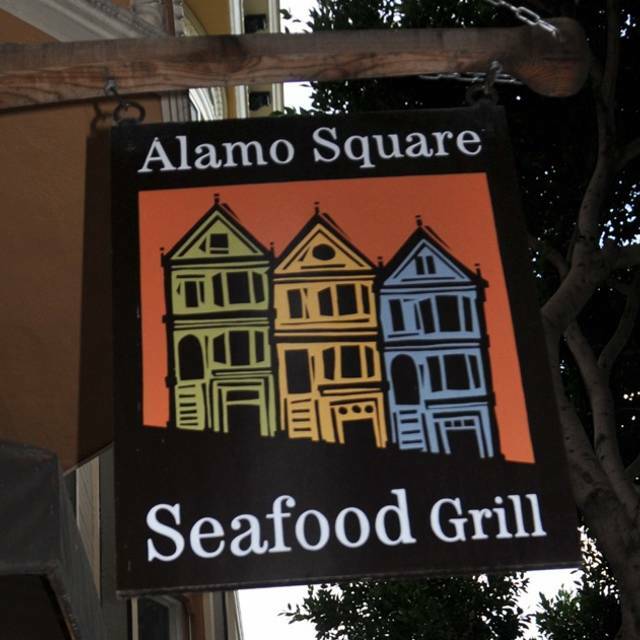 The Alamo Square Seafood Grill, has become our favorite pre-night out dinner spot. It’s a quaint neighborhood restaurant, with great food. We love the staff and the food is always great. The chief attraction of this restaurant is the free corkage on Wednesday’s. San Francisco restaurants in desirable neighborhoods are by necessity expenditure, so I do not fault them for that. However, more effort could be applied to the quality of the dishes. One my guests said it was the worst calamari he’d ever had. It took four requests to the disinterested waitress to get s salad which arrived without dressing. Some of the dishes were good and it is a nice, if crowded, room. I don’t think most of our party would consider going back. We were looking for a BYO seafood restaurant in San Francisco and had a wonderful meal at Alamo Square Seafood Grill. We started our night by visiting the "Painted Ladies" houses on Alamo Square Park (think: Full House TV show) and then walked about three minutes to Alamo Square Seafood Grill. Charming environment with art on the walls, comfortable seating, and more. We enjoyed lobster bisque and a pear and spinach salad, followed by crab cakes and sole in a burre blanc sauce with roasted seasonal vegetables. Super meal, friendly service, and all in a restaurant where it's clear that the locals go. Thank you! Highly recommend. Alamo Square Seafood Grill is a hidden gem. It has a neighborhood place vibe and is a very reasonable place in a pricy part of town. The fish is fresh and is customized to your taste. For an informal evening it's a great choice. I also liked that it wasn't loud, though the fun sound track keeps the good vibes going. On every visit, this one especially, the service was impeccable, the food of excellent quality, with good presentation, and the value excellent, esp. for Hayes Valley. The wait person was attentive and friendly. Splendid vacation dinner experience. We have lived in Hayes Valley for 17 years. I've been here several times and was somewhat disappointed this time. the salad was supposed to be mixed greens but it was mostly spinach that was not fresh. I had opted not to get the spinach salad in the first place. the main course was excellent, the wine was excellent,and the service was also excellent. We had a delightful evening. Loved the food. Service was exceptional. Will make this spot a regular. Out waiter was incredibly rude. I will not be returning to this restaurant. Food was good. Our server seemed in a hurry. Excellent service is part of an enjoyable evening. It wasn’t bad, it’s just that he wasn’t attentive. Did not ask if we we’re ok or needed anything as the meal progressed. When we had questions about the menu he seemed like he had somewhere to go. Which was odd because they were so slow we didn’t get to try desert. All in all, most enjoyable. Unlike what other reviewers indicated about the service we found it to be spot on, friendly, and well-informed. The garlic/olive oil/basil bread dipping sauce is delicious. The tuna tartare special in the appetizer side of the menu was fresh but overly spicy. The taste of the tuna was unfortunately lost in the hot shuffle. The entree, a shrimp risotto laced with spinach was quite good. 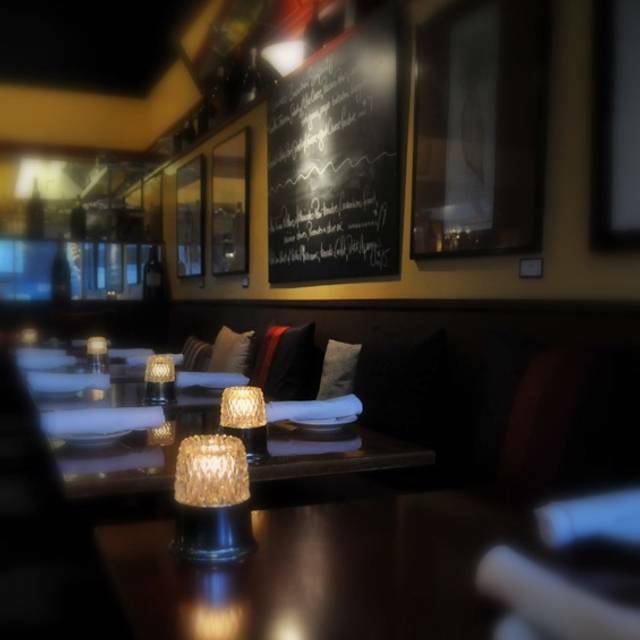 Pricing overall fair and ambience conducive to an overall enjoyable neighborhood restaurant. Server was great. Food quite delicious. There was only one waiter for a packed house, service was extremely slow. Portions were skimpy, with fewer selections available than listed on the menu. Probably an off night, would be willing to try it again. This place is ideal if you are looking for a nice quiet dinner. So if you are looking for a small, intimate place for just a few friends you may want to consider coming here. Plus there are some non seafood entrees for those people who don't want to seafood. My husband and I arrived before the restaurant opened around 4:45 after walking (.8 mile) all the way from the theatre district in the rain. The owner/manager was mopping the floor upon arrival and refused to let us inside to use the restroom so we waited on a bench outside. When the restaurant finally did open, we weren't even told and only realized it had opened after we saw other patrons going inside. Once inside, we were told to seat ourselves anywhere since we were the first to arrive. We brought our own bottle of wine and since it was Wednesday, no corkage fee. Our server was the same person who was mopping the floor. He put a candle on every table except ours. Though he served us warm bread and some yummy aioli oil and opened and poured our wine, he was not the least bit friendly. I mentioned we had reservations thru Open Table and his response was, " Do you think I care?" His total lack of regard for us was apalling and actually quite alienating, casting a disquieting tone to our whole dining experience. Our server never checked back on us after taking our order, although he spent lots of time chatting with neighboring table guests who arrived after us. He did admonish them however for being 30 minutes late for missing their reservation. He was also observed greeting others warmly, seating them and reviewing the nightly specials. We felt like outsiders and wondered what we did wrong to warrant his rudeness. My husband overheard him speaking to one of the chefs saying, "God, I'm gonna die here!" Eventually we were greeted by a second female server/assistant who was friendly and more responsive to our needs. She brought our entrees, refilled our water, brought salt upon request and more bread. We chose the creme brulee for dessert which was very good! The price for the meal was a good value however, the ambiance was lousy and we will not recommend to our friends nor return there, EVER!! VERY DISAPPOINTING for a local neighborhood restaurant. Excellent local restaurant. We'll be back. Great fish and dessert. One of our go-to neighborhood restaurants. Best food-for-value around - especially if you like seafood. Great neighborhood spot. Everything was fresh. Great low key spot & you can’t beat the price. Will come back numerous times. We had a reservation for 7pm on a Friday night. We arrived by 6:55. The place was full. Fortunately a table cleared around 7:10. Service was slow to begin, as the place was full. There was 1 server and the owner, and a woman who cleared tables. After the place cleared, service was much better. The food is outstanding, that's the real star of this place. We paid the regular price for our meal, not the prix fixe and it was not too much for such a great fish cooked to perfection. I'd avoid this place on a Friday night and will try to go sometime during the week and try the prix fixe. That looks like a super deal. They squeezed way too many people in for Valentine's dinner. We were stuck in a corner and because of that couldn't face each other and the waitress kept bumping into the people next to us. They sped through our dinner and forgot my date's dessert, I had to remind them when they brought the check that she had never gotten it. They clearly were not equipped to handle that many people. Although the portions were small for the price, the food was good. Great value. Tasty food. Not sure why there are so many negative reviews about service. Ours was fabulous. We went for Valentine’s Day and really enjoyed ourselves. We had a very pleasant dining experience with delicious food, nice ambiance and great service at the Alamo Square Seafood Grill. Out waitress, Suzie, was very attentive to our schedule as we had a show to catch, yet she was not hovering or disruptive. Timing was perfect, our appetizers, seafood entrees and creme brulee for desert were all scrumptious. A truly enjoyable meal. After several years away I have returned to favorite place of twenty years ago. Interesting selection of sauces and cooking styles. Andre knows what he’s doing. Absolutely astonishing. One of the most cozy and nice places in the city.